April 20, 2010, 3:01 p.m.
By Laura McGann @lkmcgann April 20, 2010, 3:01 p.m.
Big update on the Mark Fiore story: His editorial cartoon app, NewsToons, is finally available for sale in the iTunes App Store. The app — smartly marketed as “the app Steve Jobs was talking about!” — is available for download here, for 99 cents. After our story, Apple faced a wave of criticism from around the web, and the company invited Fiore to resubmit the app for approval on Friday. Apple CEO Steve Jobs called the initial rejection a “mistake,” but critics still worry about the editorial control Apple has over the content sold in the App Store, on iPhones, iPod touches, and iPads. POSTED April 20, 2010, 3:01 p.m.
McGann, Laura. "Apple approves Pulitzer winner’s iPhone app; cartoonist now free to mock the powerful on cell phones." Nieman Journalism Lab. Nieman Foundation for Journalism at Harvard, 20 Apr. 2010. Web. 19 Apr. 2019. McGann, Laura. 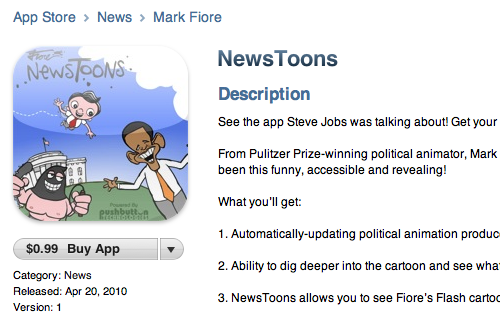 "Apple approves Pulitzer winner’s iPhone app; cartoonist now free to mock the powerful on cell phones." Nieman Journalism Lab. Last modified April 20, 2010. Accessed April 19, 2019. https://www.niemanlab.org/2010/04/apple-approves-pulitzer-winners-iphone-app-cartoonist-now-free-to-mock-the-powerful-on-cell-phones/.